"Hitsville U.S.A." is the nickname given to Motown's first headquarters. A former photographers' studio located at 2648 West Grand Boulevard in Detroit, Michigan, near the New Center area, it was purchased by Motown founder Berry Gordy in 1959. It was converted for use as the record label's administrative building and recording studio, which was open 22 hours a day (closing from 8 a.m. to 10 a.m. for maintenance). Following mainstream success in the late 1960s and early 1970s, Gordy moved the label to Los Angeles and established the Hitsville West studio there, as a part of his focus on television and film production as well as music production. By the end of 1966, Motown had hired over 450 employees and had a gross income of $20 million. In 1967, Berry Gordy purchased what is now known as the Motown mansion, in Detroit's Boston-Edison Historic District, as his home, leaving his previous home to his sister Anna and her then-husband, Marvin Gaye (photos for the cover of his album What's Going On were taken there). In 1968, Gordy purchased the Donovan building, on the corner of Woodward Avenue and Interstate 75, and moved Motown's Detroit offices there (the Donovan building was demolished in January 2006 to provide parking spaces for Super Bowl XL). In the same year Gordy purchased Golden World Records, and its recording studio became Motown's Studio B. In 1972, Gordy relocated the Motown Records headquarters to Los Angeles. The original Hitsville studios, which had produced a long string of worldwide hits, is now the Motown Museum. The following year, he reorganized the company into Motown Industries, an entertainment conglomerate that would include record, movie, television and publishing divisions. Many Motown fans believed the company's heart and soul were lost following the move and that its golden age of creativity ended after its 13 years in Detroit. Esther Gordy Edwards refused to move to California and was put in charge of what was left of Motown's Detroit office in the Hitsville building. Edwards received several requests for the Hitsville building to receive visitors. She and her secretary put up posters and gold records. She also carefully preserved Studio A. 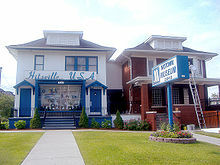 Since 1985, the Hitsville U.S.A. building has been the site of the Motown Museum, dedicated to the legacy of the record label, its artists, and its music. On October 23, 1988, Michael Jackson donated a black fedora and studded white right-hand glove, along with $125,000, the net proceeds of the first show of his Bad World Tour on October 24 in The Palace of Auburn Hills, to the Motown Museum. Edwards's granddaughter Robin Terry maintains involvement as both board chair and CEO. Three of the original homes are used by the Motown Museum. Hitsville U.S.A. and the Jobete office are connected for the exhibit, which contains costumes, photos, and records from Motown's success era. Also featured are Motown's Studio A and Berry Gordy's upstairs apartment, decorated to appear as they did during the 1960s. The finance department is currently an administrative office. West Grand Boulevard is named "Berry Gordy, Jr. Boulevard" in the area where the Motown Historical Museum is located. The museum is one of Detroit's most popular tourist destinations. In October 2016, the museum announced a $50-million-dollar plan to expand the museum in order to create space for interactive exhibits and recording studios. Since the announcement, the museum has received donations from organizations like The Kresge Foundation, the AARP, and the W.K. Kellogg Foundation to help with both the expansion as well as community programming. The Motown piano is an 1877 Steinway & Sons Model D grand piano, used by many musicians, including the Funk Brothers studio band, at the Hitsville U.S.A. Studio B from 1967 to 1972. On July 24, 2011, Paul McCartney was in Detroit for a performance at Comerica Park, as part of his On the Run Tour, and visited the Motown Museum for a private guided tour. While touring Studio A, he asked to play the Motown piano, only to find that it was not in playing condition. It was restored in 2012, with the support of McCartney, and was played by McCartney and Berry Gordy during a charity event in September 2012. The piano was inherited by Motown after it bought Golden World Records in 1967. The Golden World studio then became Hitsville U.S.A. Studio B. The piano is on display in Studio A at the Motown Museum. In 1992, Motown released two four-CD boxed sets compiling 104 singles released during its "Detroit era", entitled Hitsville USA: The Motown Singles Collection 1959–1971 and 76 singles from its "Los Angeles era", Hitsville USA: The Motown Singles Collection Volume Two 1972–1992. ^ "Michigan History: The Golden Age of the Motown Sound". The Detroit News. Archived from the original on January 21, 2013. Retrieved August 17, 2008. ^ Buijk, Cherri. "Music: 'How sweet it is ...'". Metro Times. Retrieved March 24, 2012. ^ a b "Motown Historical Museum: Detroit". Motown Historical Museum. Archived from the original on August 18, 2008. Retrieved August 17, 2008. ^ McCollum, Brian (November 18, 2018). "Detroit's Motown Museum expansion: Expect a big 2019 for Hitsville". Detroit Free Press. Retrieved March 15, 2019. ^ McCollum, Brian (October 17, 2016). "Motown Museum announces $50 million expansion". Detroit Free Press. Retrieved March 15, 2019. ^ "Motown Museum in Detroit plans $50 million expansion". chicagotribune.com. October 17, 2016. Retrieved March 15, 2019. ^ "Plans to expand Detroit's Motown Museum get $2M boost | Entertainment & Showbiz from CTV News". www.ctvnews.ca. December 22, 2018. Retrieved March 15, 2019. ^ "Kellogg Foundation grant to boost Motown Museum programs | National Post". March 12, 2019. Retrieved March 15, 2019. ^ "Sir Paul McCartney Calls on Steinway & Sons to Restore Some Motown Magic". Steinway & Sons. March 1, 2017. Retrieved March 11, 2017. ^ Graff, Gary (August 30, 2012). "Paul McCartney Restores Motown Piano, Will Play It at Fundraiser". Billboard. Retrieved March 11, 2017. ^ "Restoration completed on historic Motown piano". Daily Herald. Arlington Heights, IL. Associated Press. September 1, 2012. Retrieved March 11, 2017. ^ "Hitsville USA: The Motown Singles Collection 1959-1971 Review". AllMusic.com. Flinn, Gary. "Come and Get These Memories". Archived from the original on February 21, 2013. This page was last edited on 17 April 2019, at 04:41 (UTC).